The device is designed to be used under crucial circumstances. This strongly requires experience. You will most probably fail in fulfilling your task successfully if ignoring applied instructions. Please carefully examine device specifications, the user manual, the health notice prior to using the device. 1 Instructions related to the micro ear unit. 1.1 Micro earpiece is a personal usage device and thorough ear canal cleaning is required each time prior to inserting the earpiece. 1.2 Different size ear units are supplied with each audio security kit. Everything is anatomically dependent. Generally, it is preferred to use two ear units simultaneously in both ears as well as to use a larger earpiece over using a smaller one, since this provides biaural sound, more stable and powerful output volume. This is, however, limited by two things: your ability to insert the earpiece deep enough to hide it and your ability to keep listening to sounds around you. c) one smaller earpiece one ear (less output). 1.3 Human ear canal is cartilaginous in the outer side and is a bit S-shape. To ease the insert, pull the ear cochlea up and back, this makes the canal straight. Insert the ear unit deep enough in order to hide it. 1.4 Always insert the earpiece by yourself. Never allow other person to place the earpiece into your ear. You must feel it. This prevents any damage to the ear, because you always feel yourself. Using a finger to put the ear unit is usually quite enough. Avoid using other means to push the earpiece deep and never move your head directed towards the earpiece being inserted or removed. 1.5 Removing the ear unit is easy. It is noticeably magnetic. You will be able to remove it with any metal stick of a similar diameter. Do not use a spare earpiece to eject the one in your ear: forcible collision of two magnets can damage them as well as can harm your ear. 1.6 Note, ear units inside ears block listening to the outside thus affecting feedback of your speech. Most people start speaking louder subconsciously, so, please control yourself. 1.7 Always handle ear units one by one. Always place each of them in its separate plastic container. Forcible collision of two magnets can damage them. 2 Notes related to the loop transmitter. 2.1 Actual sound volume depends on a distance between the induction transmitter and the earpiece. 2.2 The loop emits magnetic waves perpendicularly to its coil surface. So, please consider the loop orientation in direction to the earpiece. This is not important if you place the loop on neck, but this is important if you place the loop elsewhere. Please study a drawing to understand it better. 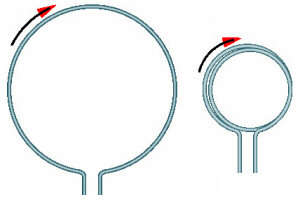 2.3 The loop should always form a circle-shape coil to operate properly, i.e. if you draw it into an extended oval or crumple it - it will not be able to produce magnetic field fluctuations. 2.4 You can twist it two or three times for arm or shoulder application, but it still must form a less diameter coil. Electric current should flow one direction only. 2.5 The loop can be positioned on a neck, put though an arm, on a shoulder. Other placements offer less output, but are still possible (on an arm, on a chest, on a back, etc). Symmetrical transmitter placement allows biaural listening. Asymmetrical is suitable for monoaural applications, they offer greater latency, but provide less output power. e) other monoaural (on an arm), or biaural (on a chest, on a back) placements. 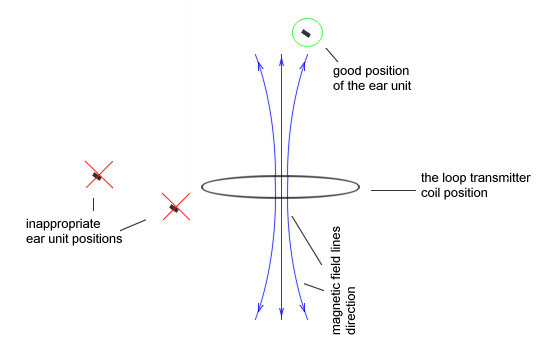 2.6 The neck loop produces waste heat while generating a magnetic field to drive the ear unit. The process is electrically inefficient due to its natural physics. This is a normal loop operation. Its noticeably, but slightly warm for a normal speech application. It can be hot during a playback of a maximum volume endless full bass spectrum music. Adding a cloth under the loop fixes the situation. No level of the heating of the wire can damage the loop. 2.7 The transmitter loop contains a set of wires. Never apply much force to pull the loop to avoid breaking the wire. 3 Notes related to the headset main module. 3.1.1 The headset is turned on and off with a single power button on board. Press and hold the button for a few seconds for action. Yellow light should appear when on. 3.1.2 Use an applied wall adapter to recharge the headset. Red light means charge is in process. Green light means charge is completed over 90%. Total charge time from a fully discharged state is about 2-3 hours. You may freely leave the headset charging for another pair of hours after green light turns on: rechargeable battery would be slowly charged up to 100% during that period. 3.1.3 For reference, you should expect several hours of continuous duty of speaking application of the headset. Excessively loud and bass music can exhaust the battery in about an hour. Standby time (when no sound is played) is days. But you should turn the headset off with a power button if unused. 3.1.4 Always store the headset fully charged if unused for a long time. This ensures long life of rechargeable batteries. All chemical sources of power like being stored charged. 3.2.2 To set up a pair, the headset must be in a "pairing mode" (searching for a master Bluetooth device). The light blinks blue/yellow rapidly when the headset searches for a master Bluetooth device. Turn on the headset. Long press the BT button (hold it more than 5 seconds) to turn on a pairing. At the same time, make a search for Bluetooth devices in your phone. Once the headset is found - pair it. The passcode is 0000. Then connect the device as a headset, set up as an allowed for auto reconnect device. 3.2.3 If the headset was already paired before, and if it is set up as an "allowed" device in your phone, it should reconnect each time automatically. Or you should reconnect it by either selecting the headset name in your phone list of Bluetooth devices, or by short pressing the BT button. 3.2.4 The headset and a cell phone must be within usual to Bluetooth 10 meters direct visibility range. The distance must be less if there is no direct visibility. This means the phone (player, walkie-talkie, etc.) should be somewhere behind you. 3.3 Understanding a volume level set up. 3.3.1 Always set up an actual phone call and adjust the volume during conversation. To test it exactly for you phone and exactly for your phone call partner. 3.3.2 The headset main module has volume control buttons. Your cellphone also has volume control buttons. 3.3.2.1 During a cellphone call. In the very most of cases, these buttons act as full analogs of each other, i.e. you may adjust the volume with any buttons you like, and volume level setting is synchronized on both the headset and the phone. 3.3.2.2 During playback with a player. Volume control buttons on the headset main module and on the phone (or Bluetooth player) do not act as full analogs of each other, i.e. you adjust the volume level setting independently on the headset and on the phone (Bluetooth player). 3.4 The main board functionality. 3.4.1 The main board should be normally placed in a pocket. Sometimes it may be desired to keep it away from cellphone to avoid noises. Wires should be traced under clothes. 3.4.2 By pressing a BT on the board you can easily initiate a last number dialling. Such functionalities, however, depend on your phone model and phone settings. Remember that pressing the BT button over 5 seconds will force it into pairing mode. 3.4.3 Pressing the same BT button during a call will end it. 3.4.4 A detachable beeper button has a special feature. Besides solely beeping, long press of the beeper button acts as the BT button press. You will hear a tone with the micro ear unit when this virtual BT button press activates. This is useful when you need to initiate, answer or end a call, but you can not press any buttons on the headset main module. 3.5.1 The external microphone should be hidden somewhere in your clothes. This must be fixed in place reliably. Using a pin is the simplest. Since the microphone is rather sensitive, remember to avoid contacting the microphone with your clothes, this can produce noise. 3.5.2 Deliberate touching the microphone cap with a finger produces a specific noticeable noise, this can be sometimes used for simple communications, however, using the beeper button is the best choice. 3.5.3 Avoid wearing too solid clothes for the best whisper detection. 3.5.4 Do not place a cellphone or a walkie-talkie too close (within centimetres) to the headset's external microphone, this can invoke occasional buzzing. 3.6.1 Long wire beeper button is designed to be placed normally under a feet toe. Use an adhesive tape to position the button exactly under a finger. Once pressed, it produces a virtual tone into the microphone. This is quite useful for simple yes/no communications. 3.6.2 Smart men can use a Morse code, but, the most ingenious idea is to use the order of letters on cellphones and send a sequence of numbers in short/long beeps. A T9 vocabulary can easily identify such phrases. 4 Guides related to a cell phone or a 2 way radio. 4.1 Do not forget to turn off all sounds, alarms, reminders and a vibrating alert on your phone. You can more likely lock a keypad as well: this does not affect headset buttons. 4.2 Always set up a pair and connect the security headset and a phone via Bluetooth before setting up your phone ring tones, sounds, volumes, etc. Cellphones settings are split into profiles, this ensures that a "headset" profile is currently active and that you are modifying this exactly profile settings. 4.3 Do not forget to raise an other side person's phone talk sound volume to the highest possible level for the best whisper recognition. 4.4 Set up an automatic incoming call answering on your cell phone. This allows you to pick up a call without need of pressing any buttons. Please note, some phones do not allow an automatic calls answering if in a "silent" mode profile. Instead, record quiescent with a phone sound recorder and set it as a ring tone. 4.5 Set up a last dialled number on your cell phone to the one you wish to call. You can easily dial the last number by physically or virtually pressing the BT button on the headset main board. 4.6 Set up your phone to connect to paired Bluetooth devices automatically. This allows to reconnect at any time if the connection is dropped accidentally. 4.7 You are advised to place a cellphone or a walkie-talkie a little bit away from the main electronic module of the headset. Cellphones or walkie-talkies are a few watts power GHz transmitters. If they are directly close to the headset, they can make radio transmitting unstable or invoke noises.